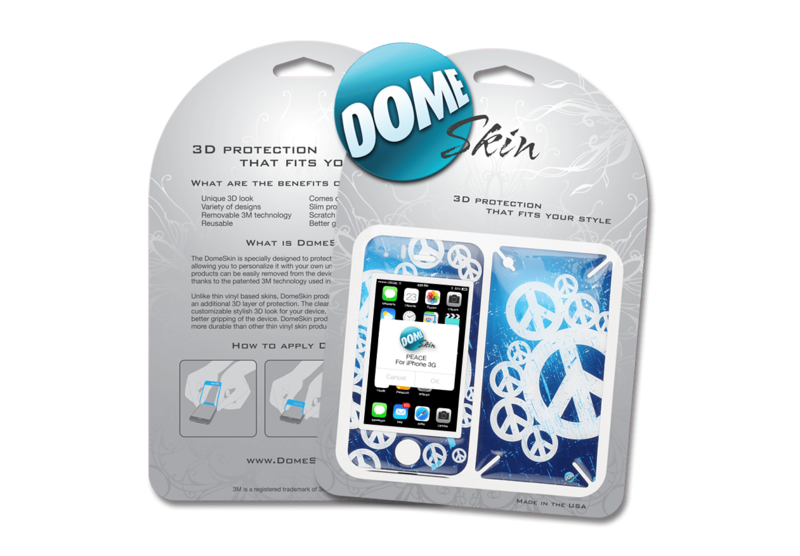 A world apart from flat device skins, DomeSkin makes 3D, customizable device skins that allow for unique personalization while offering better protection. In addition, DomeSkin can be easily and cleanly removed from a device thanks to the patented 3M technology used in the construction. Because they are reusable, customers can change their DomeSkin frequently depending on their mood or style. DomeSkin wanted to redesign their brand in order to grow the company and have a unique, consistent look to distinguish the brand from flat skins. They planned to extend the branding across all marketing materials and media with a new logo, print ads, packaging, website, email blasts and social media marketing. I worked with DomeSkin to design and create a new and improved branding and logo identity to represent the company and products in an illustrative way. I designed and created a series of trade print ads and innovative packaging, including sourcing a print vendor in China in order to reduce production costs. I also created a new DomeSkin website which featured a user interface through which customers could upload their own artwork for a personalized DomeSkin. In addition, I developed an email blast and social media campaign to attract new business. DomeSkin was very pleased with its new direction.